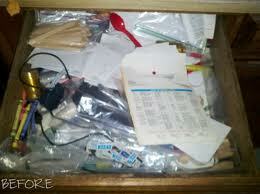 In almost every house, no matter how much of a neat-freak may live there, clutter tends to gather. At least a little. For some people, it’s a real problem. My parents (love them) are packrats. My in-laws (whom I also love) are also packrats. The point being, My Mr. Right and I… yep, packrats. My husband often says that his mom collects anything on paper (report cards, mother’s day cards, ect) and his dad collects EVERYTHING else. And it’s true. My parents, they just collect everything, both of them. My mother has so many dishes, there isn’t room to store them all. And my dad, well, there are still cases of floppy disks in the office. Yeah, like the big, more-ancient-than-dirt floppy disks. And My Mr. Right and I, we’re just like them. We have two boxes of electronic equipment that are mostly parts… I don’t know what for though. And I threw out probably 50 magazine issues when we moved last year. And almost $2000 in textbooks from college. Ok, $2000 is what I paid for them, not resale value. But, I had books from my first semester… 5 years ago! I didn’t read them when I was taking the classes, so I sure as heck wasn’t reading them last year. How do you avoid this? Well, it’s simple. To say. It’s a lot harder to actually do. Here are a few tips on ways to de-clutter your home. 1. Everything should have “a place”. This will be repeated. Just so you’re warned. Most people instinctively organize, to a point. You don’t keep your pots in the bathroom or your bath towels in the bedroom. You keep them near the areas they are used in, right? Well, if you run out of “places”, you don’t have room for any more things. So, don’t get any more. 2. Get rid of some before you bring more in. For example, my mom had a whole huge cupboard full of plastic containers. Mismatched, some melted, some warped. 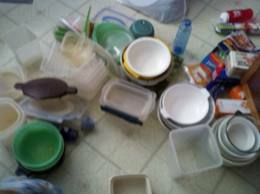 I hated putting leftovers away because it was such a battle to find lids and containers that fit. So, I threw them all out. Every single mismatched, melted and warped piece in that cupboard. Then, I replaced them. Not the other way around. 3. Work small. You don’t have to get a whole room done in one day. While you’re on the phone, clean out a kitchen drawer. Waiting for the dryer to finish so you can switch the clothes over? 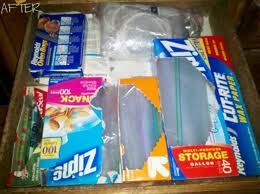 Clean out and organize your supply shelf or basket. Bookcase overflowing? Work on one shelf at a time. It doesn’t all have to be done right now. 4. Baskets. 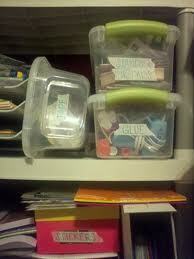 Baskets, or other similar containers, will add an immediate feel of organization. Why? Because everything has “a place”. And like things are kept together. You know where to find things and where to put them away. 5. Store like items together. Keep all your shoes in one place. Toy trucks go in one drawer. Crayons and markers get another drawer. All of your bags (purse, diaper, church, school, work, ect) go in one area. You’ll be so much more organized if you have “a place” for everything. And it will cut down on that frantic search as you’re trying to hurry the kids out to the bus or find your keys in your purse that you left…… somewhere. 7. Go digital! It will definitely take time, but scan your old photos on to the computer. You can get external hard drives and store tons and tons of data. We have a computer hooked up to our TV. Little Monkey can watch digital copies of his favorite movies without ever touching scratching a DVD. I love that they have digital copies when you buy DVD’s now. And we don’t have to store all the DVD’s and cases. I said “don’t have to”… never said we didn’t. Hehehe. =] There are a lot of magazines online now too. Although, I do like the feel of the glossy paper between my fingers… not quite the same as holding a mouse. 8. Get rid of books. Ok, now when I say this I am referring to the books that are sitting on shelves and have been for the last three years. Without ever being opened in that time frame. The rule of thumb I use: if it hasn’t been read in the past year, donate it. If you read the book, by all means, keep it. 9. Go Paperless! Many, many, many companies now offer a paperless billing option. I highly suggest you receive your statements in an email. It will cut down on the paper clutter in your home and you can access your email anywhere you have a connection. More than once, we have been somewhere that needed specific documentation and forgotten a piece of paper. Because we have things stored on the internet, it was easy to access the needed documentation at that second and show the officials. Otherwise, we would have had to go back again later. And no one likes government buildings right? You can set up an email account that you use solely for paperless billing if you’re worried about it crowding your inbox. 10. Don’t keep things you don’t have room for. Anything you bring into your home needs to have “a place” before it comes in through the door. Your Auntie Dee left you her huge correspondence desk in her will? But you have no room for it? Sell it and then donate the proceeds in her name. You might need that griddle that is still in the box? Bet you have a neighbor or friend you could borrow one from. Your wedding dress is too special to part with? Take a photo and give the dress away. Your daughter probably won’t want to wear it anyway. Or make a quilt, or something else you can actually use, from the fabric. The memory is the important part, not the physical item. Do you have any de-clutter tips? *Subscribed* I love your site! I constantly have a bag I’m filling for Goodwill and am amazed at how easy it is to declutter once you start…I used to keep everything because I might, possibly, need it one day and now that I’ve gotten rid of a bunch of stuff, I have so much more room! Great tips! My husband will be retiring in a few years and we might downsize to a smaller house. Which means I can’t bring all this STUFF with us. I’ve been systematically cleaning and organizing the attic. I love the Salvation Army Store but I have a rule: I have to donate about 10x more than I bring home. Generally, that means two or three garbage bags in and maybe a book or a sweater out. My attic is finally starting to look like something. So I totally agree with ‘work small.’ It really does get the job done! Great tips! I try my best to do all of these but there are a few areas I know can be worked on. Thanks for linking this up last week! Just wanted to let you know that I “ Featured” you on Santa’s Gift Shoppe Blog Hop today for your great project & inspiration! Be sure to grab the “I was featured” on Santa’s Gift Shoppe Button/Code for your sidebar! You deserve it! Thanks so much..If you’re not a follower already we’d love for you to join us…Have a WONDERFUL Week!! I have a bad problem with keeping stuff for future “projects”. As long as it finally has a place I won’t be worried about it. 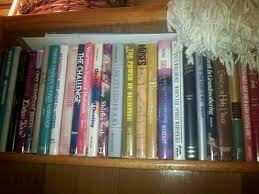 I am collecting books for my little girl like Harry Potter, Narnia, Twilight, and so on and so forth. Anything else I can do without….well, maybe my Philipa Gregory Books. My biggest thing is I feel like I am drowning in recycling. We live a ways from town, and so the recycling just collects, and collects until I get fed up, and haul it into town. I have thought about taking some with me every time I go to town, but this doesn’t always see to work for me. Well, between the dog chomping at the bit to go out, and trying to get my 4 year old daughter out the door, I tend to forget things. sigh. I decluttered at the beginning of the year but having read all your fantastic tips, I think I should give it another go! One thing I’ve found out from experience is that the sooner that you donate things sorted out for donated, the better–it’s amazing how many things find their way back into the cupboard whilst waiting to go to the charity shop! great tips. Go paperless is the best. I did this several years ago and it really impact the mail I received and had to deal with on a daily basis. does’nt it feel great when your done! Worth a days work. I am having 2 giveaways on my blog. $15 store credit from hair candy for girls. All you have to do is leave a comment saying you want to win it. Great tips- it can often be overwhelming to take on a large decluttering task. I think that starting small and focusing on one thing at a time is definitely key. Visiting today from Thrilling Thursday at Paisley Passions! Moving between countries really teaches you what to keep and what to purge out. For my birthday this year I am getting a e-reader so that I can go bookless finally. No more books to move, well except for my craft books. I am also the daughter of packrats and I was one at one point, but there is hope for us. I am doing the get organized and decluttering thing. Reading posts like this between chores revs me up to get back at it. I have so many books and I hate to part with any of them. But that’s a good suggestion – if I haven’t read it in a year, why keep it?? Great suggestions. I will be referencing this post time and time again. Bookmarking it! I would also add…inventoring your “STUFF”. like the deep freeze. and craft supplies. and the pantry. so that way you are not doubling up! My cluttered apartment was definitely on my mind today. I need to get this place under control! Thanks for this post. I’m glad I’m not alone 🙂 Thanks for the reminder that a little at a time goes a long way!